This is not about the Mad Men finale. 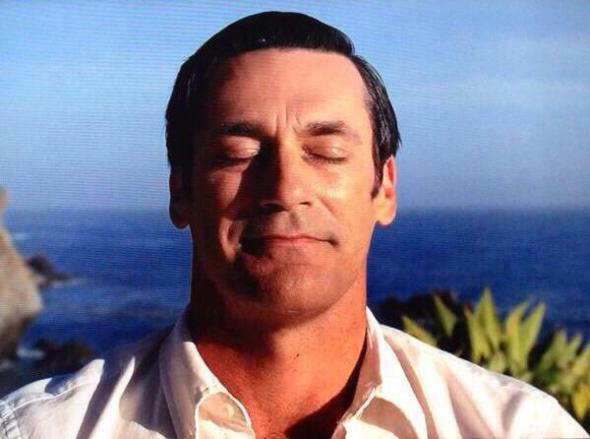 I have no reason to discuss the finale of AMC’s lauded Mad Men. There’s plenty of talk already about it, and I’m sure we’ll have at least a couple days more as well. But one thing that we will have plenty more of — something the show crystallized all too clearly — is brand identity. If you listen to strangers speak, perhaps at a train station, or in a park, or chit-chatting on the phone at a grocery store, you’ll hear various phrases, cliches and brand trappings come up in what should be described as normal, ordinary conversation. And they’re not brought up with irony or commentary. They just become part of the currency. And it often perplexes me how long these stay in the blood stream, no matter how many cultural livers it kills. Every day you will see a twist on the old “Got Milk?” logo in that emblematic font style. When we think of large gatherings — any one will do — why do we instinctively attach a “-palooza” to it, as if that still has cultural relevance? Darker than that, every scandal is a “…gate.” Even when we aren’t given branding, we go out looking for it and once found, we hang onto it hard. No wonder then that modern celebrities try to foster those immediate connections with batches of words, acting as a sort of product placement that is integrated into casual conversation. Like Beyonce or not, she knows that the co-opting of words like “fierce” and “flawless” somehow keep her memory alive in-between projects. For any pop star, the crime is not to have critics bash your music…it’s to have the critics forget you so much they feel no need to bash your music, or even regard you. The end of the Mad Men finale, much like the end of The Sopranos, will be groused about for years to come, just as the show starts to look weirdly aged without intention. (A side note: I recall a statement a filmmaker said about film dating. Take a period piece shot in 1959, 1979, and 1999. Although they are all about the 1700s, they will all look mostly like the era in which they were made. Film stock (video rates), editing choices, to dolly in or to zoom, all these are little giveaways.) What will not age is the thought that the zinger that closes the series out is created by a brand identity that is so much more powerful in our consciousness, it immediately acts as narrative, commentary and punchline at once, and nobody has to explain it. Owning the collective consciousness so intrinsically, with so little material, is a dangerous thing.